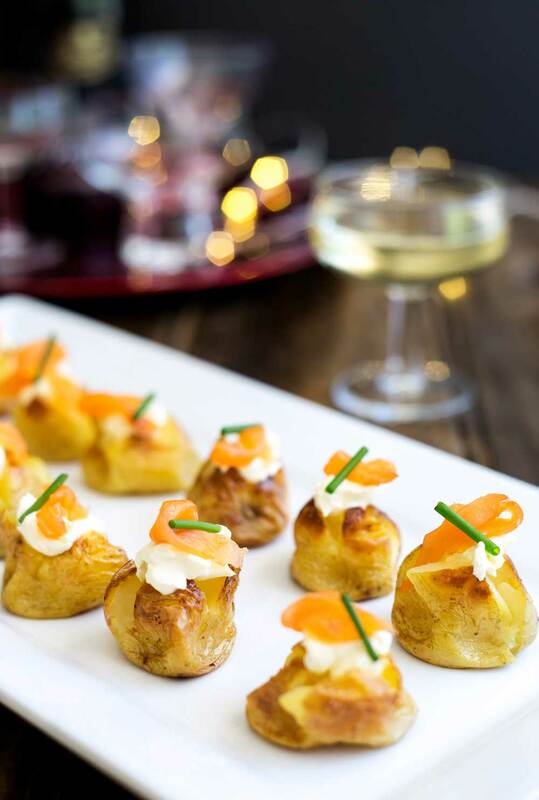 These mini baked potatoes with smoked salmon and sour cream are perfect for parties. Simple yet impressive. You can prepare them ahead or stick them in the oven as your guests arrive, making them perfect for New Year’s parties. And they make a small amount of smoked salmon go a long way! How is 2015 over? I am pretty sure last time I looked it was August!!!! If you read my prepare ahead roast potato recipe you will know that Stew and I made the big decision not to move home for Christmas. It was a bit of a wrench as we have been pinning our hopes on being in for Christmas. But it was the right decision. We have waited this long to get back into our family home, that a couple more weeks won’t hurt. Although with temperatures soaring and the thermometers hitting 40ºC we are not enjoying the painting!!!!! But we can see the end and 2016 will be the start of life in our new house. Whether I make it to the bells or crawl into bed early you can guarantee I will have eaten plenty of food and drunk a few glasses of bubbly! 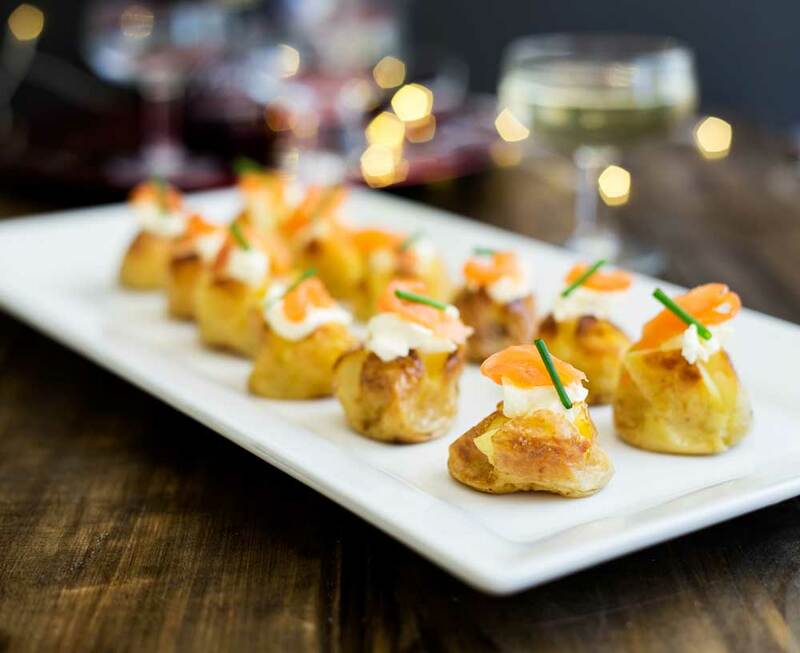 And these mini baked potatoes are perfect! They are miniature which means you can easily eat them in a couple of bites, i.e perfect finger food! No one needs a plate when they are trying to hold a glass of wine and mingle! 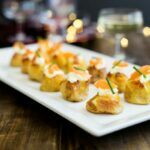 Secondly they are super simple to make, can be made in advance AND if smoked salmon isn’t your guests’ thing you can mix up the toppings to suit everyone. A little sliver of roast beef would be wonderful. Or for complete vegetarians/non-fish eaters add a thin slice of roasted capsicum. 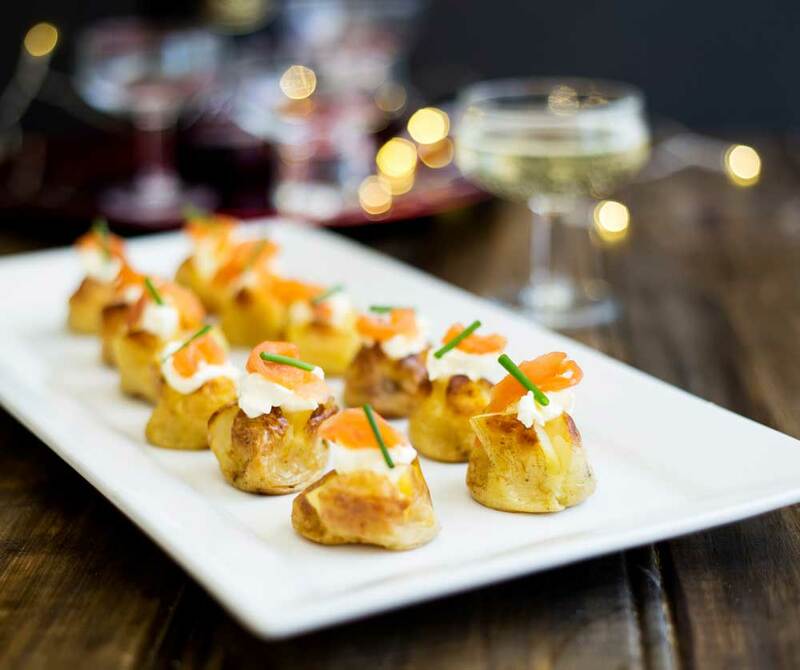 These mini baked potatoes with smoked salmon and sour cream are perfect for parties. Simple yet impressive. You can prepare them ahead or stick them in the oven as your guests arrive, making them perfect for New Year's parties. And they make a small amount of smoked salmon go a long way! Tip the potatoes into a roasting tin and drizzle with the olive oil. Season generously with salt and then roast for 20-30 minutes until tender to the point of a knife and crispy on the outside. Whilst the potatoes are roasting mix the chopped chives and sour cream together, then set aside. Cut the smoked salmon into small strips. Remove the potatoes from the oven. At this point you can set them aside for later and serve them cool. 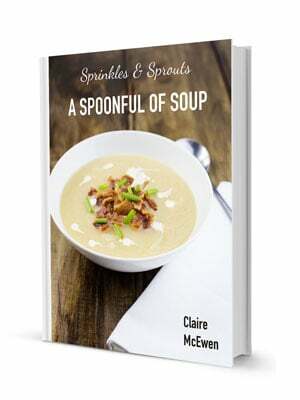 Or continue on with the recipe and serve them warm. Once the potatoes have cooled enough to handle, carefully pinch the potato and and push them open into the classic baked potato shape. Top each potato with the sour cream and a slice or two of smoked salmon. Garnish with a chive strip. Claire – these are super cute and would be a welcome sight at any drinks party. Good thing you can make them as people arrive because I don’t think they’d last very long if I made them in advance! Good luck as your big move home approaches, and thank you so much for all your support this year. However you’re celebrating, a very happy new year to you! ? Paul, thank you so much for your comment. I couldn’t agree more!!! I made these up before New Year so I could get some photos. They only just lasted the photo shoot! My boys were waiting to steal them! !